One of the great conundrums for storytelling in games lies in trying to provide enough of an outline of a game narrative to ensure it is semi-directed enough to go somewhere compelling, while also providing an open sandbox experience for promoting player driven stories. 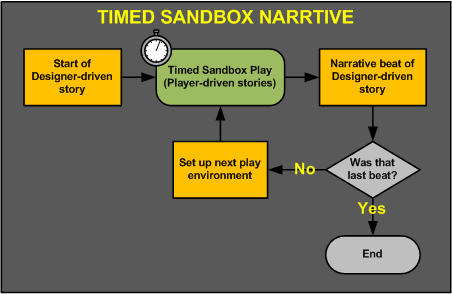 I would like to propose that bringing time itself more prominently into the storytelling process may allow both player and developer to take turns at the wheel to drive stories harmoniously in sandbox games. Combining sandbox and designer-driven story been done quite well in games such as the Grand Theft Auto series, where there is a set storyline provided by the game, but the player can generate many emergent stories of their own. However, nothing pushes the story along at all other than the player, and this arguably forces them to suspend disbelief – As we know, the world doesn’t wait for us (and arguably less so for those competing in the world of organised crime). This is not a system I have tried to put in practice, but rather, one I would very much like to. My ardent wish here is to find ways to improve storytelling in games, and if that happens by someone else running with the concept first, that will be just as satisfying to see. At the end of the time limit, scripted story is brought to the player – A major narrative beat. I have attempted to keep this system above, and the ideas below as open as possible, so that they can work with games of both varying size and scope, single-zoned environments (you stay within or keep returning to the same physical area), or multi-zone ones (the story moves to new locations after narrative beat). Keep in mind, this concept is more about finding ways to add some cohesive interesting narrative to games that are primarily sandbox. The more narrative that you pump into this system yourself, the more it will drift towards being a more traditional quest driven game, and the more likely you will need to actually have to wait for the player to achieve conditions before moving on will work. Time – The time between beats. This will determine how long a player has to experience the stories they drive themselves. Sandbox scope – How much ‘world’ you let the player loose in. Sandbox density – How much content and opportunity exists within the world. When it is time that determines when the designer-driven side of the story needs to move on, and the player could be in all manner of places and situations, this means it is the designer’s job to bring the story to the player. Instead of say, asking the zombie apocalypse survivor to reach the military bunker to encounter the largest group of survivors in the southern states, the game would have the survivors come to the player. Force the encounter! Bring the narrative beat. Or perhaps instead of asking the NYC detective to arrive at the exact right place to find the murderous femme fatale he has been tracking through Soho, have her come to the detective’s location all on her own. These examples use time to define when a narrative beat will take place. Let’s take a look at a totally sandboxed gaming experience to provide some context – Minecraft. The player is let loose in a world where it is entirely up to them to choose what to do, what goals to set themselves, and how to approach them. While the merits and appeal of such a gaming experience cannot be in question when you consider how many people take enjoyment from Notch’s offering, it is also clear that the game offers no real story of its own. It generates the setting for a player-driven story, and that’s it. Now imagine if Minecraft offered a series of events that had a serious impact on the world that would force the story the player experienced to shift. Perhaps a group of rival miners could wander into the player’s domain and compete for resources. Maybe a thief could begin assaulting the player’s storage units, and leave a trail or clue as to where they have taken them. An impossibly large horde of monsters could sweep in from the west, forcing the player to flee east and discover a new type of biome that did not exist prior to this event. Of course, having a mandate of watching the clock to have key plot points take place could potentially be a bit dull for the player if they’re engaged with the story you have provided for them. After all, we essentially live in a sandbox world, and many of us are very self determined about trying to head towards the milestones in our life stories. So in this system, while it is super important not to force the player to find the story, it is equally important not to totally hide it from them as well. This can be achieved by providing exceptions to the timer. If the player does make their way to the military stronghold in the zombie apocalypse game, why make them arbitrarily wander around outside it for a day before the forces inside come out to engage the player? There is nothing in the proposed system that enforces emergent stories to have to be snuffed out, nor does it preclude the ability to provide secondary (possibly optional) story arcs that can cross these milestones as well. All the designer is required to do is ensure that opportunities exist after the beat for these story arcs to either continue, or reach their completion. In practice, this will mean that again, the story may have to come to the player. For example, let’s say you have an NPC that the player has conflict with escape from the scene in a rather close fought battle the player is unlikely to forget (player was heavily injured themselves, the battle raged over several minutes, etc). Rather than just put them somewhere randomly in a future location, take steps to have the player stumble across them again. Or perhaps the player may find a diary of another lone traveler who has similar goals to the player – Don’t leave the future encounter entirely to chance. These things CAN be left to chance, but the larger your world is, and the more difficult it is to explore in the time you allow, the more benefit you will gain from taking steps to help things happen. Expecting players to endlessly replay your game to try and discover all the hooks AND their continuing events you have scattered throughout your game is selfish and unrealistic. It’s the designer’s job to provide good experiences for the player to have, not the player’s job to toil endlessly to try make them happen. This proposal here has some clear and obvious bumps in the road that will need to be avoided. Some ideas on how to address these are included, but more ideas would be incredibly welcome – As are other identifiable challenges. 1) When you bring the story to the player, the game must account for the player being in a vast myriad of situations. An apparent solution to this would be to ensure every location in such a game has a defined ‘entry point’ for the story to arrive. This could of course be very time consuming to execute in a game with lots of locations, or demand some very clever algorithms to ensure this works well in a procedurally generated environment. It may also require a fair range of contextual conditions to check for – Is the player in conflict? Is the player being aggressive towards characters that may be key to the story? This may not always be a bad thing, as it may simply make the experience seem very dynamic or even dramatic from the player’s perspective – However, it’s also very possible the player could be thoroughly engaged in a story of their own making, and you may effectively be ripping them out of it. To say that determining if the player is engaged with their story is difficult would be an understatement. Perhaps designing systems to be conducive to good short-term player stories would be the best way to address this, mitigating the chances of breaking something the player had spent time getting invested in. A great onus is upon the designer to ensure that the story they bring to the player makes some sort of sense. This is not really unique when introducing characters or events in any sort of story, but if the player’s sandbox experience is providing them with a context that clashes with what you bring to them, then this could be an issue. The designer may need to ensure heavy playtesting is done in the sandbox to get a grasp of the variety of contexts and perspectives players will adopt – But with everyone being unique, catching all cases may be impossible. If anyone can point to a game that has done what I am proposing, or can offer ideas, solutions and criticisms, all of these would be most welcome! Minecraft does this in a way. It is not developer made scripted story, but it does push the game’s narrative along. You start off there are no zombies, so you go off do your own thing. Night hits, monsters first appear. I semi-agree… I think that is the ONE narrative beat that Minecraft provides, your first night. Yeah, it is not exactly what you said, but the day/night cycles still does push the narrative along. Spending your night atop a huge hill where no monsters spawn is still the player’s story being pushed forward, it was directly in response to a narrative beat. Finding shelter before night, is a tense part of playing minecraft. imo, the day/night cycle fits pretty well into your definition of narrative beat, expect for the fact that it isn’t a scripted story. Player is let lose, after a time limit the story is brought to the player(night/day -world becomes more/less dangerous), the player is set lose on the new world for a time limit, repeat until player gets bored. Yes, its not exactly what you describe, but I thought it would be interesting to draw similarities. To make the distinction though, we’re talking ‘designer scripted narrative’. That’s what Minecraft lacks. The first night feels like a scripted event because of the sudden shift in atmosphere and threat, but it’s still just part of the sandbox. By the way, YOU were one of the people who made me think about this concept a while back – All your talk about DayZ made THAT the setting in my head for what you could do with a system like this. Obviously the community there are generating their own stories to the point you could argue the game doesn’t need it… But players like me might. I think I’m a little adverse to sticking with sandboxes where you can get on top of the mechanics, get comfy, and then not have anything come along that can really rattle you or force you to experience something new. I am also flattered that all my talk planted a seed of thought in your mind, I was hoping some people would give it deeper thought :D.
And I actually think that this is a very elegant solution, I think I should of mentioned this before, but it is quite impressive. I actually had a couple of game ideas that were put into the “too complex/hard for now” pile that might actually be feasible now with this approach. (With some modification to the game idea, but the core experience is still there). Great article! That dance between player agency and authored experience is an awesomely juicy topic. I recall having a debate once with a friend who said he hated Half Life 2 when on his second play-through he realised that much of the cinematic flair of the game was scripted and designer driven rather than in his hands, where I felt that the illusion of agency was more important than actual agency: So long as on that first play-through I felt as though I was driving the experience, I was thoroughly engaged. The mastery of Half Life 2’s designers, to me, was that I didn’t feel like I was on a pretty motion ride. Just to raise a minor disagreement with your article: Regarding GTA (at least in GTA4) many of its primary arc missions are indeed temporally triggered, gated and/or have time limits as win criteria. While some of these missions employ fairly obvious and clunky telegraphing, such as an on-screen timer, others are more subtle. As one example, the player receives phone calls at various points throughout sandbox play (or sometimes during other missions) to indicate a new step in the primary arc is available. But my favourite example is the case of missions with a time limit, where the remaining time is telegraphed through an increasingly intense running narrative, such as a wounded character in the back seat of the vehicle yelling at you to hurry. I really like the idea of exploring means of triggering, gating and pacing without obvious fourth-wall mechanics (a huge flashing countdown on the screen) or clumsy deus ex machina narrative devices. re: the illusion being more important than the actual agency – TOTALLY agree. It’s the experience that matters, not how it was constructed. If the scripting was so good that it felt natural, then kudos to the designer! re: GTA, consider that you get those phone calls based on criteria of having completed a mission first. You don’t just get called on day 4, etc. Having a time limit to a quest is a bit different to what I’m suggesting, though if that’s not clear, maybe I could have found a way to identify that better to the reader. No it’s clear, just that the case of time limits is related (temporal mechanics!) and I felt GTA provided some good examples. A common time triggered progression is when an NPC tells the player to “Come back later”. Dead Island does it a few times, though I’m not sure how it’s working internally – that “later” trigger could simply be “after a mission” or “next time you travel 100m from base”. I think though that your proposal has a lot of merit, as I can think of quite a few games which straddled that agency/directed line which might have benefited from better temporal narrative mechanics. It’s bizarre to play a game (Dead Island being the latest example) where players constantly refer to the lack of time left before we all die, and yet I’m free to go poke through trash cans for hours without any consequence. The talk about Minecraft narrative gives some interesting points into the concept of story altogether. I dont have any experience with story so I cant talk in examples directly related to story, but I can talk in examples of comedy. With comedy, you have your very odvious punch lines and gag jokes, but you also have your Shakespearean comedy and those comedic books and movies that play on funny quirks of our society and culture. These latter examples are much less odvously comedy. So with story you have your very odvious story plot that has a begining, middle and end. But with minecraft you also have a less odvious narrative happening that plays on the concepts of survival. Survival being a common narrative in movies. In your discussion about timed events, I feel like your thinking more in the former example of story with a begining, middle and end that has a plot with a story line and story arcs. A traditional type of story. In both cases, its clear that time can play a very important role in driving a story. With movies and maybe books, time is a concrete and static thing. But with games its something we can choose to use or not to use. Or worser, its something we can neglect to use or even be unaware that we have that ‘dynamic’. Comedy throughout the Ages by Seth Lerer, published by The Teaching Company.